Is there a way to remove the "Vault 111"-sign? If yes, I don't seem to find it. Sure, in the looks menu it is in Extras / Roboasimov / Vault 111. I forgot that was even on this preset, I may upload my latest version of this and remove it from there. It was part of a story I had ongoing at the time. Lots of people have expressed interest in this on console, which I don't have any idea about. Wish I could show you a pic. Do you know how share screenshots in this website. 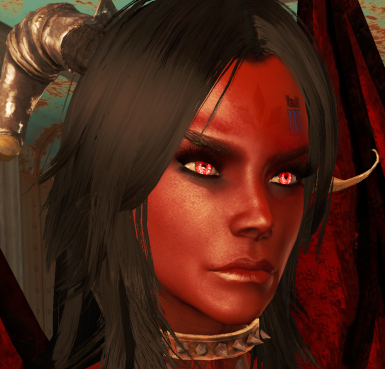 Would love to show you my demon character. I am not sure, I'm a noob at using this site. You could join my discord server and send me a screenshot over that if you like, I'd love to see it! What's the Demon stuff from? AllinAccessory has the horns. The wings are not available anywhere, I ported them from a NV mod myself. Unless I get permission, I will need to make new wings with my own 3D model /textures, then I will release them here. Looking forward to your Demon Wing Mod then. I wanna see if I can make Illidan in Fallout, so will there be different colors? Maybe, I don't really know much about making mod options or making things work with NMM/etc. yet. What color did you have in mind? Purple or Light Purple is what would be cool. Cool, I'll keep it in mind. Thanks for the suggestions!